An evil power plagues the people and it’s up to you to set them free. You must travel to the land of Alwa and help the people living there to awaken from their nightmare… You are Zoe, a normal everyday girl who just happens to like to play video games. One late night when she’s just enjoying her favourite game she suddenly finds herself dozing off and when she awakens she has been brought into the game and into the land of Alwa. 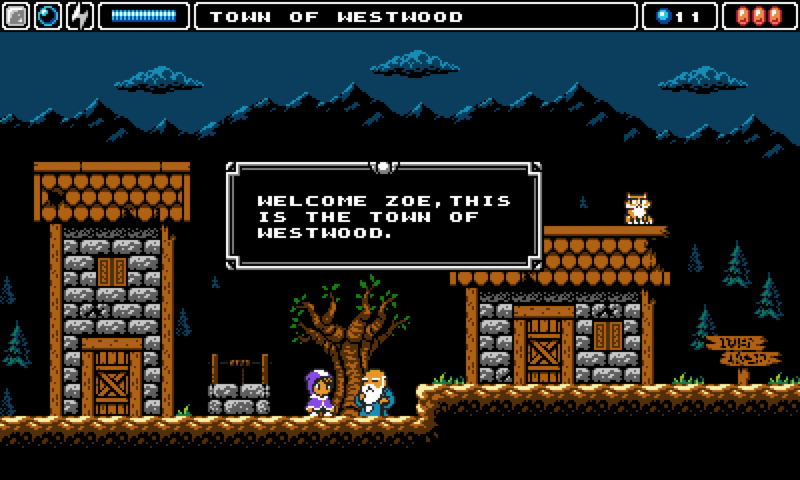 Alwa’s Awakening is an adventure game made for modern platforms but with the feel and look of a Nintendo 8-bit game. We’re inspired by old NES games such as Battle of Olympus and Solstice but also new games like Battle Kid and the Trine series. Release date and platform is yet to be determined but make sure you follow us on Twitter for updates and other fun stuff. An exciting new challenging NES-inspired game for devoted retro fans! We are four developers on this game and since we've all got jobs by day we can only work on Alwa's Awakening by night and weekends. We've been working on this game since Oktober 2014 and things are going very well. My plan is to update this thread with things from our development, if you've got questions or want to see things just let me know in the comments. Lookin' good. I like that little skeleton dude. Thank you! There are also non-green skeletons who doesn't have as much life as this one in the game. Here's a taste of our music in the game! Tomorrow I'm planning on showing some progress that was made during the holidays since I have more time then. Cool! The different magic powers look interesting. Bra jobbat! Thank you! I'll probably post a play through on one of our demo's from a few months back. In short, it's a green block that you can stand on or push to the sides and we also have the bubble that floats up in the air, you can then jump up on it and float up with it to reach higher platforms. Last we have lightning (will probably not be lightning in the end) which is the only magic that can be used as an offensive attack. Other than attacking you will be able to fire it across the room and activate switches and stuff like that. Loyal as f..nice job! I'm not exactly from this era of gaming (my brother is, i barely played 1-2 SNES games) but even i can tell it nails it down very well. I enjoy that it is not pseudo in no way, which is happening with a lot of games that try to go back to these roots. Very promising stuff. Hey thanks! Our pixel artist is brilliant! Glad you like it! Over the holidays I got som major systems working. These systems are not final but the basics are there. We save the game more properly now, the way it’s done is by writing to a text file. Saving this way makes it easier for me to have different save slots and also keep track of the different variables. Note that the layout isn’t final. So we’re keeping track of the name of the area where you saved, how many percent of the items that you’ve found and we’re also going to save the amount of the map that you’ve discovered. If you’ve got ideas of what you’ve wanted the game to save, let me know! What isn’t shown in the gif is that it’s loading a .csv file that’s been downloaded from our spreadsheet with the dialog of the game. The script searches for a string ID in the text and then reads the rest of the row. It’s set up like this to prepare for when we’re going to localize the game to other languages. If people want to know how we’ve set it up let me know and I can do an update about it and explain more. What I want to fix later is to make a new row when the next word isn’t going to fit. But it’s not a major problem for now. We've not done many visually cool things this week but we're working on dialog of the game and we're trying to nail the intro so the new players can get a feeling of how the real game is going to be. 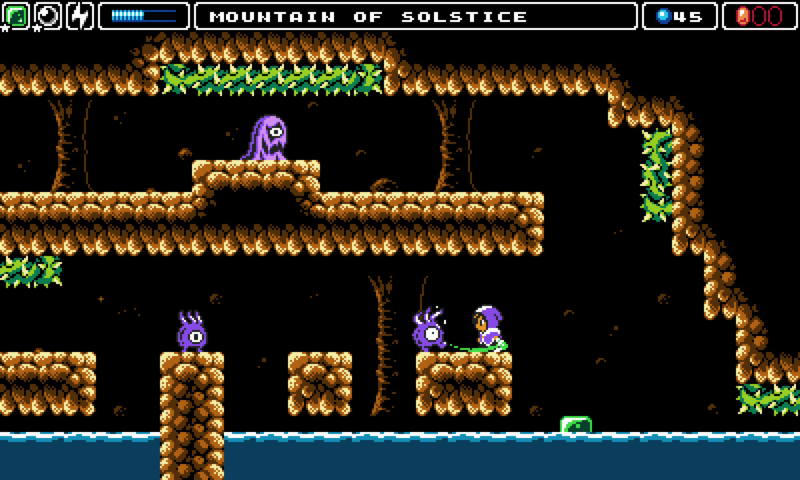 We're also discussing if we're going to add a CRT simulation for Alwa's Awakening. Link to article of how to achieve this effect. The updates that've been made to the dialog system is that I've added support to show a name of the one's who's talking during the conversation. Also that you can now receive items after the dialog. Might post an update later where I explain how we solve the import of dialogs from our google sheets. It's been a while since I last posted, but my plan is to come back and update more regularly. We've got an early mock up of world 4, it's not styled by our artist yet so it will look better in the future. I'm going to try and remember to make more gifs of the game in my future updates. Very 'fire and ice' meets Castlevania. Since you're putting in dialogue - is story going to be a big part of it? Or are there just the occasional npc encounters? Also I don't know about that unbroken burg. It looks pretty broken. Well.. story isn't going to be the main focus but it will most likely be like other NES games, like "this guy is a bad guy and he/she's done this terrible thing... kill him/her". But there will be NPC's standing around in the world that might have something useful to say or they might need some help, so there will be some dialog in the game. For whatever reason, I really like the design of your main characters. I guess I'm just a sucker for hoodies. As for the CRT filter (if you're still considering it), I'm not sure how much it will add if the game is in widescreen since it'll just end up looking weird at that aspect ratio. Thanks! We're trying to stay as close to NES games as possible. You should see how many different designs our main character went through! Different outfits, colors and size. You know, upon reflection, I like the possibility that "unbroken" could mean the people are still there, steadfast and willing, despite the town looking messed up. The graphics, while excellent, are a bit beyond the capabilities of the NES. If it's simply "NES-inspired", there's nothing wrong with that. The art is great and the gameplay looks fun. But I feel it's only right to let you know it doesn't look very NES-like if that's what you're going for. First, the aspect ratio looks to be 5:4. The NES screen is essentially square (256x240), and if displayed on a TV, stretched horizontally to fit a 4:3 aspect ratio (e.g. 640x480). Narrowing the display window would go a long way toward making it look more like a NES game. Second, and probably most importantly, the palette limitations have been exceeded. 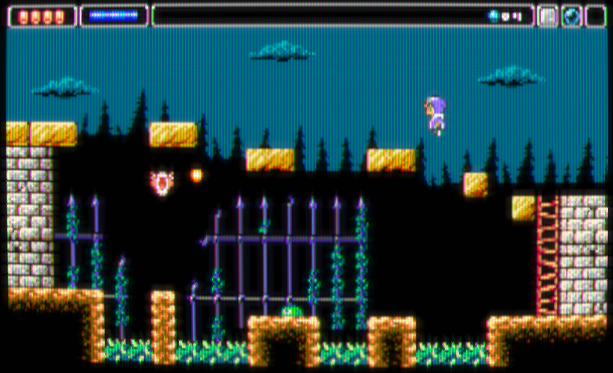 For example, the screenshot of the "garden" uses eight different background palettes. The NES is limited to four simultaneous background palettes of three colors plus one shared color (usually black). The "fire pit" screenshot is closer; it uses five background palettes but would fit four if the bars in the windows were blue/purple like the rest of the background. The enemy sprites look fine but the character sprite is four colors plus transparency; the NES is limited to three colors plus transparency. Games could simulate more colors per sprite by overlaying separate sprites (e.g. Mega Man's face), but this cuts into the limit of eight sprites per horizontal line. The current character would need three sprites for the head and I believe four for the body, so at the body level, already half of the sprites for that line have been used. The NES is also limited to four simultaneous sprite palettes. If the character uses two, that leaves only two for enemies, etc. Both the "garden" and "fire pit" screenshots use five sprite palettes, assuming two for the character. And lastly, none of the above takes into account the HUD, which has to fit into these restrictions as well. If using sprites for HUD elements, there can be only eight per horizontal line and they have to use one of the four current palettes. If using tiles for HUD elements, they have to be aligned to the grid and use one of the four current background palettes. This is why you'll often see NES games with HUDs that change color from level to level. Conforming to these restrictions will make it look more NES-like, but will require compromises. If the compromises make the game worse, it's probably better to stick with "NES-inspired" and not worry about the restrictions.